The Mazda Bongo makes a brilliant two or two plus two berth camper van. Some converters offer up to 5 berth options. The base vehicle can be bought relatively cheaply from specialist Japanese importers. These imports have the advantage that they don’t use salt in most parts of Japan to keep the roads clear of snow and ice so corrosion tends to be much less than for a similar aged UK vehicle. There are exceptions so do check carefully and if you don’t feel up to doing this properly yourself get an engineer to take a look for you. Top tip: When you get you Bongo home make the first thing you do to have the underside Wax-oiled (or similar) it may have been protected when it was in Japan but the salt on our roads means you’d better add some protection now. The Mazda Bongo is available in a range of specifications and engine sizes. Petrol and diesel are available with some more frugal than others. You get automatic transmission, power steering, air con, and safety features such as air bags. Remember these are MPVs not vans so you get more of a car level of safety and comfort. You can even find four wheel drive variants. Mazda produced Bongo camper vans direct from their factory. These have the advantage of being done to a very good specification and the fit of the furniture and other fittings is perfect. If you can find one it is likely to be less expensive than buying a similar aged van and having it converted yourself. Be aware though that the furniture and fittings will be the same age as the car and could be a bit tired. They come with an electrical hook up that is rated at 110volts so you will need to have a transformer to use this on UK mains voltage. 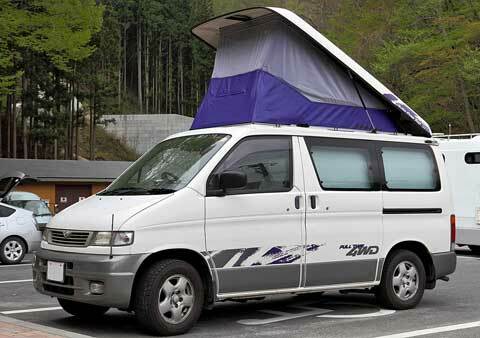 The Mazda Bongo was the vehicle that started the whole Japanese camper van conversion scene. The availability of good clean imported vans at a relatively cheap price that offered the possibility of relatively easy conversion appealed to many and a whole industry has grown up offering parts, kits and complete conversions, again at relatively reasonable prices. A nice conversion would be to fit rotating driver and passenger seats, a rock and roll bed with two seat belts, side furniture including sink, cooking and food storage and a pop up roof with beds for the kids. This conversion could be achieved by buying the parts and a kit whilst having the roof fitted professionally. Or there are a number of firms that will do part or full conversions for you. Some kits require you to make templates and cut the fit of the cupboards with a jigsaw. Clearly this and other steps in the conversion process means that a DIY converter needs to have a good level of DIY skills to be able to fit a kit to a good standard. It is a good bit more advanced than making up Ikea flat packed furniture but less onerous than starting from scratch with faced ply sheets. Looking at some of the prices offered by kit suppliers the cost of supply and fit is not that much greater than supply only. Here are some converters and kit manufacturers/suppliers that we’ve found. These are presented here with the usual health warning, we are camper van insurance specialists not camper conversion experts. We are therefore not making any recommendation for any of the companies listed. This is not intended to be an exhaustive list but should be a good starting point. We can offer insurance for DIY Mazda Bongo Camper Van conversions both while they are being converted, for up to 90 days, and once completed. Fully comprehensive insurance including commuting with a maximum annual milage of 12,000 miles is available. Get a quote today.